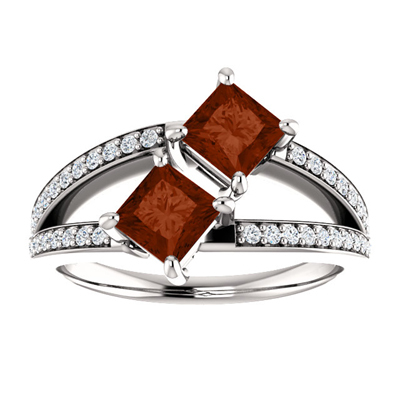 The intense style of the garnet color is certainly something that will showcase your love for someone. The two 4.5mm garnet stones at the top of this 14k white gold ring are made with princess cuts to add a special look. 46 diamonds are also included on the main body of the ring. We guarantee our Princess Cut 4.5mm Garnet and Diamond 2 Stone Ring in 14K White Gold to be high quality, authentic jewelry, as described above.